First things first, know how much you can spend, then make a list of priority’s. Cover the fixed costs first and then ring round to get a realistic figure of costs. The reception is going to be around 50% of your budget, so consider who is on your guest list wisely. Decide who will be attending your wedding during the day and then the evening. Pick a venue that reflects your style and budget. Will you have your ceremony at the same location? Is accommodation at the venue a requirement? Once you’ve finalized your guest list with your budget, you can decide on the style and theme of your wedding invitation. Invitations can take on many forms these days from E-invites to something more creative like tea towels depending on your budget and creativity. Consider whether you would like a DJ or Live band on the evening of your wedding. Perhaps a magician or a balloon artist could entertain your guests. Would a harpist for the ceremony be your style. Consider how you will arrive for your big day. Will you arrive by boat, horse and carriage or a stylish limo? Where would be your ideal honeymoon location. Is a honeymoon out of your budget? Perhaps a mini moon would be more suitable and less expensive. Traditional tiered cake or a fun cupcake tower? you can be as creative or as traditional as you like. Also remember how many guests you need to cater for. Don’t Leave wedding dress shopping too late. It’s important to set yourself a realistic budget. Considering who to take to your fittings. What about your bridesmaids and Ushers outfits? Create a playlist for all to enjoy. 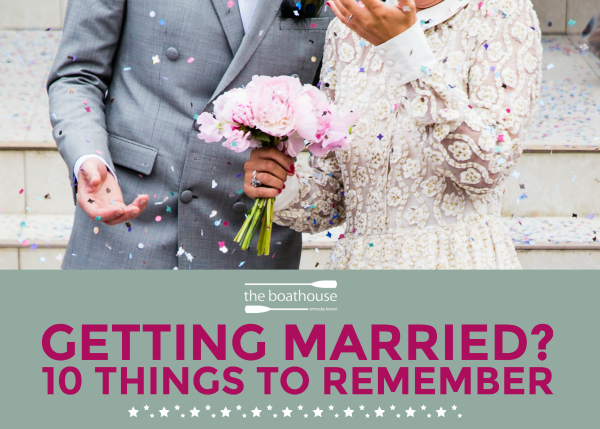 You might need a song for when your guests are waiting, walking down the aisle, signing the book and the all important first dance.